Jeff Barnum is an artist, teacher, social entrepreneur, and co-founder of two companies. He is also a change agent for one of our spiritual sister companies, Reos Partners. Jeff has a lot of academic training in art, and he sees direct links between the artistic and the change processes. Both depend on finding the solution while working on the problem, and both have the capacity to facilitate the co-creation of new collective perceptions and actions. In his article “Social Sculpture: Enabling Society to Change Itself,” he outlines the opportunities in and challenges of making mash-ups of art and community. Identifying the key mindsets that shape a particular system affords stakeholders the possibility to shift those mindsets within themselves, their organizations, and their constituencies. Doing so can radically push a large social system in one direction or another. … When facing a large-scale challenge, we need to affect the dominant mindsets in thousands or millions of people. Challenges characterized by “generative complexity” are fundamentally unfamiliar and undetermined, they cannot be addressed through a pre-formulated plan: we have to “carve” a way forward. … Because the nature of these challenges is new and unfamiliar, there are no precedents from which we can draw; instead, they require an “emergent” process through which people can find a solution while working on the problem. For a problem characterized by high generative complexity, the mindsets of the masses can be a powerful point of systemic leverage and a powerful force for systemic change. The key challenge in making a work of art is to arrive at something powerful and interesting without knowing exactly how to do so. An artist works in situations with no pre-existing solutions. What is it about artistic processes that might help us work in systemic challenges with high generative complexity? The defining characteristic of a creative process is that it structures the process of metamorphosis. The social application of the creative process is, it turns out, the main idea of artist Joseph Beuys, who coined the term “social sculpture” in the 1960s and 1970s. … Social sculpture is the extension of art beyond the museum and art world into the realm of shaping social reality. It is an art form in which everyone creatively participates to shape our shared social reality together. Antanas Mockus, the former mayor of Bogotá, is famous for his theatrical interventions that quickly, effectively, and inexpensively changed behaviours across Bogotá and beyond. He is sometimes maligned as a “clown” or other such pejoratives because of his “antics”, but actually, there is a discernible rigor and discipline to his approach. Mockus’s most famous act addressed the city’s most dangerous intersections, places where pedestrians were frequently hurt or killed. First, he placed large bronze stars in the ground to signify the death of a citizen. Then, he distributed 350,000 large cards, each with a green thumbs-up on one side and a red thumbs-down picture on the other. Finally, he deployed 40 mimes at the problematic intersections. The mimes theatrically championed good driving behaviour and shamed bad driving behaviour. Bystanders could hold up a corresponding card. The effect was instant: A mixture of awareness of mortality and the fear of humiliation changed driving behaviours within a few weeks. 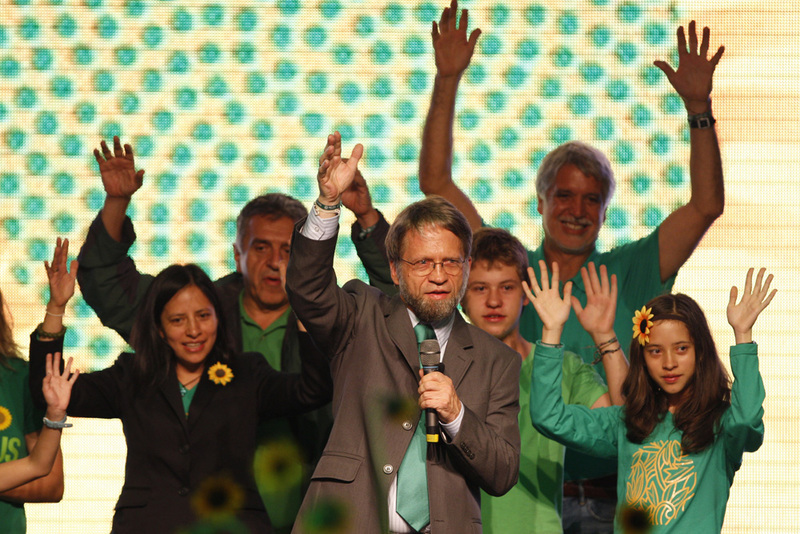 The measure was so successful that Mockus hired 400 more mimes. Over time, the new cultural norms stuck. The bronze stars are still there today. Mockus is methodical. He carefully plans each intervention to enable his fellow citizens to recognize and then realize their aspirations and needs for a healthier society. In this way, he strategically and systematically taps into what has been called “cultural agency” or “cultural power”: the ability for asocial system to metamorphose itself from within. Could it be that we can solve many of our social challenges if we understand, focus, and apply cultural agency in this sense? What might a “social sculpture” practice look like? In our work, as in so many social change efforts, initiatives often focus on influencing the powerful few in business and government to act. Involving such leaders may seem or be necessary, but I wonder if it also reinforces the belief that we’re dependent on only a handful of people to change social reality. I believe that our dependence on the powerful few to cause systemic transformation needs to change, and can change. The key, to me, seems to be in the social sculpture: the collective creative power of everyone to change the ways we think, see each other, and live. To me, the future of social innovation is the work of enabling society to change itsel. This is, I believe, the new art form of social sculpture. Download “Social Sculpture: Enabling Society to Change Itself” here. Thanks for the write-up. One thing I didn’t make clear enough in this article is that the concept of “social sculpture” isn’t necessarily related to “public art.” Moreover, the social sculpture is the society we all create together. That’s the essential point. In the present and future, society is either co-created (regenerated, recreated) or inherited (more of the same)—and many of the institutional and cultural habits we’ve inherited are inadequate. While the artists I highlighted do use “public art” as a means of intervention, the key point is that they are intervening at a paradigmatic level, the level of mindsets as Donella Meadows calls them, where “the master idea reigns in the minds of many persons” (Emerson, “War,” 1909). By touching these invisible but pervasive ideas directly and artfully, they’re engaging their societies in a massive inner reorientation. Perhaps this wasn’t clear enough in the 2010 article—and it should be, so that we learn to intervene artfully in the invisible but formative origins of society. After all, we’re already creating society—most of the time, we’re just not aware of our doing so. Thanks again Mitch and team! Thanks for the clarification, Jeff. I like Emerson’s concept of ‘where the master idea reigns in the minds of many persons’. I also appreciate your notice that we are always actively creating society, but too often are not at all aware of this reality. Because we are biological beings we are always learning. And being a conscious species gives us a very unique chance to learn to co-create the societies we want, not the ones we inherit. These are powerful ideas. Thank you for sharing them.